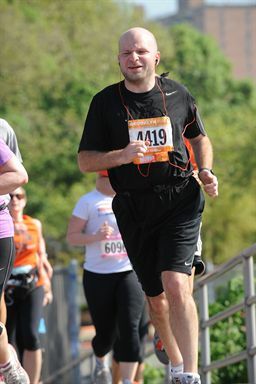 This past Saturday, I ran the Brooklyn Half Marathon. This is the first long race I’ve run since The Walt Disney World Half Marathon and has significance beyond just being a long race. In the dark hours of Saturday morning, I drove out to the New York City borough of Brooklyn to run with my friends Jocelyn and Carolann and about 10,000 other runners. With a rolling start of the corrals, the race was on at 7am and we began to move in unison from the start line. We ran twice around Prospect Park, where I was able to run a couple of miles with Carolann before we split up just before leaving the park onto Ocean Parkway. A long, straight run from the park to Coney Island was fairly visually uninteresting and sunny until the 13th mile, when the boardwalk came into sight. With the beach to my left and the amusement park rides looming on the horizon, the wooden planks beneath my feet rumbling with the sound of footfalls until the finish line was reached. My goal for this race was to beat my Walt Disney World time, which I felt I could do because I’ve been training an additional four months and there were none of the narrow points like the Magic Kingdom. My official Disney time was 2:22:30 and my official Brooklyn Half Marathon time was 2:13:59. 8 minutes and 31 seconds down from just months earlier, a successful run. The other significant milestone with the completion of the half marathon is the first step towards the 2012 New York Marathon. For members of the New York Road Runners, completion of nine qualifying races in New York City, plus volunteering for one race, allows an individual an automatic entry into the following year’s marathon. This is commonly referred to as the 9+1, and the Brooklyn Half Marathon is the first step towards the 9+1 for me for an entry into the 2012 New York Marathon. Completing the Brooklyn Half Marathon is yet another milestone in my running career. From having never run before February 2010 to heading on the road towards the New York Marathon is just more motivation to continue on and keep running to bigger and better heights.